“Those bottles of premade mixes that line the beverage aisles of supermarkets are the Hamburger Helpers of the cocktail industry: you don’t need ’em. Mixing a good drink requires a bit of care, but anyone can do it. Most real cocktails contain little more than fresh citrus and a few other accompaniments like bitters or simple syrup (boil equal parts water and sugar, just until the sugar melts; store in the fridge, forever). Oh, and enough booze so that you can taste it. 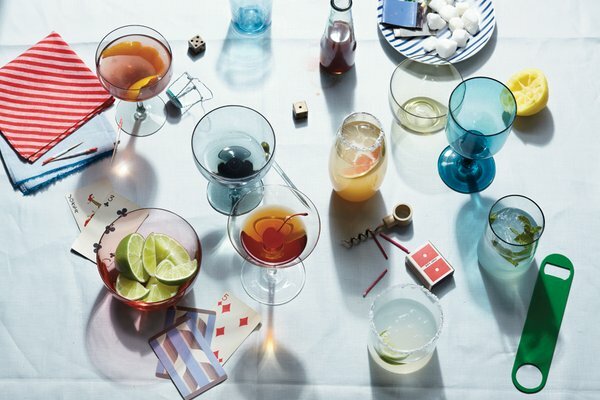 Most of these use a stiff pour of alcohol, about a quarter cup, about a third more than the average “jigger.” (Most drinks made with the average jigger taste weak. At least to me.) I ran these proportions by my favorite bartender, Jim Meehan at PDT, the speakeasy behind the phone booth in a hot-dog joint on St. Mark’s Place in the East Village, and the author of the stylish “PDT Cocktail Book.” He approved. Use the recipes as guidelines and customize according to your preference. These drinks do not disguise the flavor of the booze, something to keep in mind when buying bottles. Whether Grey Goose is “better” than Smirnoff I leave to the tasting panels, but it’s easy enough to taste the differences among bourbons, gins and tequilas. That doesn’t mean that the most expensive is the best (I like unaged, blanco tequila, which doesn’t have to be pricey), but bad-tasting liquor will make a lousy drink. Mark Bittman is The Times Magazine’s food columnist and an Opinion columnist.